Need extra storage room and have no more room left? Sounds like me. 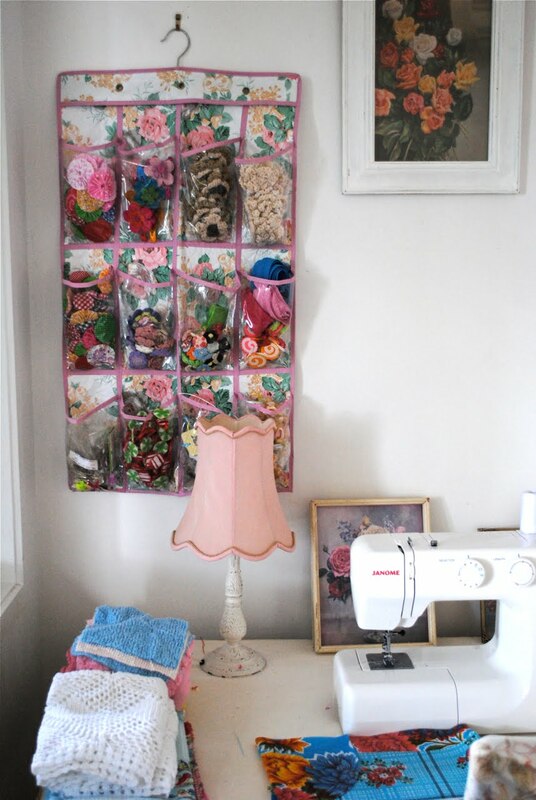 How about a nifty vintage shoe rack turned craft holder? I had been meaning to show you this project of mine for some time. 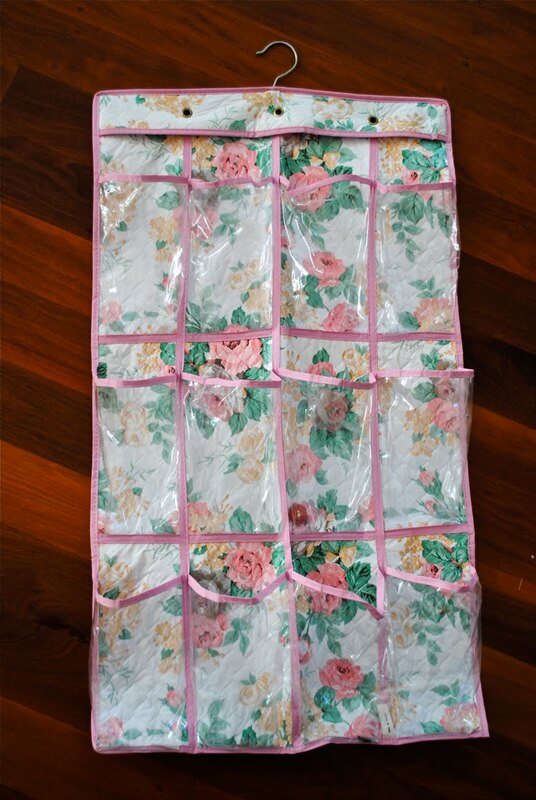 It was a plastic vintage shoe rack I purchased from Lifeline for $3.00. I just loved the pattern of the plastic. I had no idea what I was going to do with it until I bought it home. It has now been transformed into a crafty organiser to hold all my bits and pieces. These old shoe racks are perfect for holding all kinds of treasures. And you simply hang them on a wall! Instant wall art as well don't you think. I hope this weekend is a joyous one. I hope it warms up for me. I am freezing! What a great idea Simone! Pretty and functional at the same time. Have a lovely weekend and keep warm! I repurposed a makeup bag for my craft tools, I love this one! That's really pretty. And clever..as always! Those things are great for crafts and toys. And of course shoes! Such a great idea....brrrrrrr...I am freezing too...where is our Summer weather???? I love this idea. I have one on the back of my laundry room door. This is now my junk drawer. Now I see I need another one for my craft space right above my sewing machine. Perfect idea. Yep, those are great to have. The best part you can see everything. Sort of like a crafting supply inspiration board. windows. Helps give you an idea of what you have. Keep warm. It's in the 80's here. Love this! It's not only keeping you organized, but it looks pretty too! Have a great day! i LOVE this idea you genius. What a lovely and colorful idea. One more cute project, Simone!! I LOVE it!! Have a warm weekend!! Love, Bela. What a clever idea. Perfect in taht you can see what you have stored there. Love it. oh it's beautiful! i adore it! Wow Simone what a super, super idea. I have so many little bits and pieces all stowed away in drawers but then they are hard to see and that stifles creativity. This see through plastic is perfect! Thanks for the idea! 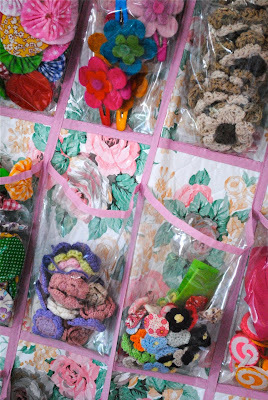 I love pockets, drawers, jars and anything that I can stuff doodads! Great idea. I have a square wooden shoe rack ( holds 18) sitting on my kitchen counter ~ I have labeled each opening and I use it for mail, BILLS and school papers. It's perfect!! Love those old shoe holders, it looks great! I love it! I want one now. great idea! I am looking for one (or three) of these to hang up for my kids to store their ever growing collections of Beanie kids. That is just perfect - I need one! You find the sweetest things, Simone. Or do they find you? ...Great quick & cheerful!...thanks for sharing!...we have started our "summer" holiday months we are very cold!...but our daughter is going to Australia in Sept so hopefully she will have great weather there! Hope you have a FAB 4th!! It looks great,think I may have to pinch your idea..Tara..